There are two ways of measuring thermal conductivity: the stationary and the instationary method. The stationary method is principally simpler as it proceeds from a constant temperature level, whereas the instationary method takes the problem of a changing temperature field into account. There is an advantage resulting from this extra effort however: the instationary method provides measuring results for the thermal conductivity much faster and the results are less influenced by convection. According to POLTZ the stationary method is seriously hampered by the fact of thermal conductivity induced by convection. In Tuluol, for example, an average flow rate of only o.01 mm/min leads to a deviance of about 1% in the data obtained for the thermal conductivity due to free convection. Therefore, POLTZ concludes that the stationary method, especially in an experimental set-up where the thick layers are concerned, cannot provide measuring data without a noticeable influence of convection. Furthermore, great care must be taken to avoid any kind of forced convection, such as would be caused by vibration of the measuring apparatus. 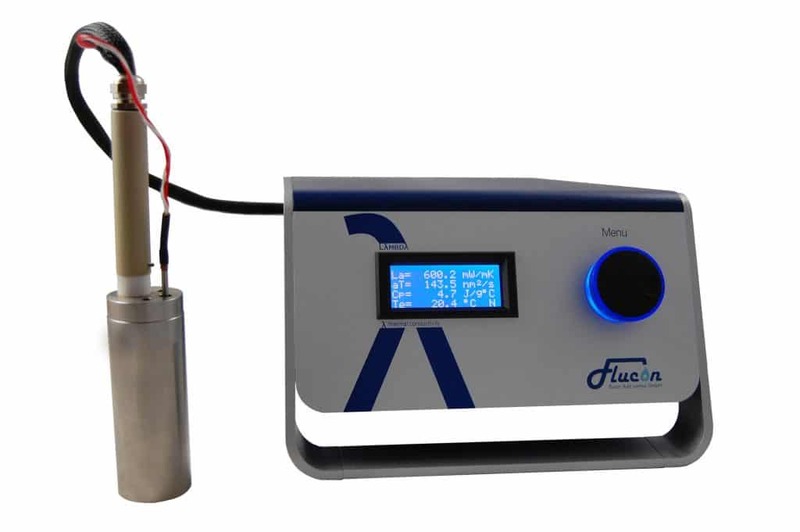 The LAMBDA measuring device developed by flucon combines the advantages of the fast instationary hot-wire method while at the same time excluding the influence of convection in the measuring process. This is achieved by computer processing the data obtained within very short periods of time (approx. 800ms) which in turn leads to a very short over-all duration of the measuring process (approx. 60 s). The hot-wire of the LAMBDA serves as the source of the heat and as the transducer at the same time. In order to raise the temperature, the hot-wire is subjected to a constant measuring current; as the surrounding medium warms up, the resistance of the hot-wire will change in accordance with the thermal viscosity of the surrounding medium. Thus the change of voltage in the hot-wire indicates the change of temperature taking place in the surrounding medium.